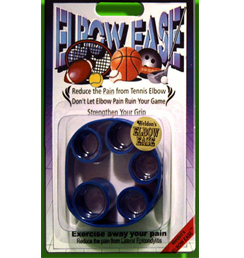 ELBOW EASE ® WORKS GREAT FOR GOLFERS, TENNIS PLAYERS OR ANYONE WHO SUFFERS FROM ELBOW PAIN OR STRAINED MUSCLES IN THEIR FOREARM, AND FOR ANYONE WHO WANTS TO STRENGTHEN THEIR GRIP. A wrist pain is particularly susceptible to injury for people who spend long periods of time typing at a computer, playing the piano or video games as well as participants in sports which involve lots of wrist motion. Elbow pain is most often the result of tendinitis, which can affect the inner or outer elbow, overuse or strain on the elbow joint components, but some causes are due to trauma, infection, and/or autoimmune processes. Restricted range of movement in the finger joints is a sign of an inflammatory issue, which can be through injury to the finger joint, old tendon injuries, sprains or sometime from arthritis. Any repetitive gripping activities, especially if they use the thumb and first two fingers, may contribute to Lateral Epicondylitis or most commonly known as Tennis Elbow pain. Pain in the forearm can arise from injury or inflammation that affects any of the tissues of the forearm, including the muscles, bones, blood vessels, tendons, and skin. Your grip strength is an indication of your full body strength, neuromuscular activation, and overall function. Are you a person that is always on the go? Are you an avid tennis player or golfer or someone who loves being active, playing sports or fussing around the garden? Are you always experiencing elbow pains? Using armbands or arm sleeves just temporarily mask your elbow pain, icing your elbow isn’t always practical either. If you’re looking for something that gets rid of your elbow pain that’s easy to use and can be used if your elbow pain returns, well look no further! 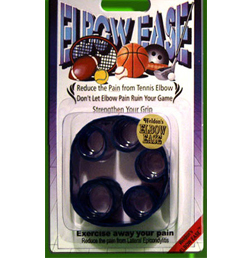 For better elbow pain relief, use Elbow Ease. It’s a silicone band that does its magic through exercise. It not only relieves your elbow pain but it also relieves any pain in your outer forearm and can also strengthen your grip. It fits in your pocket, desk-draw, work out bag and in your car. You can use it anywhere at anytime. BEST OF ALL IT WORKS. We ship Worldwide, please see the Order Page. Elbow ease is the newest innovation out on the market for use in reducing elbow pain. The inventor, developed an acute case of tennis elbow several years ago due to playing tennis weekly, for years. His doctor recommended getting a cortisone shot or following the RICE theory; Rest, Ice, Compression and Elevation or that he should stop playing tennis for a while. All those things only provided temporary relief and since elbow pain is a repetitive, degenerative ailment he knew that this pain would come back sooner or later and he wanted a cure that would work time after time. So he decided to create something that would, through exercise, relieve his pain. It’s a silicon band with finger loops inside the band. By extending his fingers outward he was able to exercise his forearm muscles and the tendons connecting them to his elbow. He felt it work immediately. After a few weeks his pain was gong. During this time one of his friends, who had elbow pain, from the vibrations of riding her bike, asked him if she could try it. A few weeks later she returned it touting how well it worked and that here pain was gone. He knew that he had something that could help anyone with elbow pain and got a patent (6,179,751). By targeting the right muscles through exercises your elbow pain will eventually be reduced. Also, with continued use he was able to strengthen his grip. We guarantee that it will last for years, with the same positive results. Squeezing is the typical motion for strengthening muscle in the forearm and to help prevent tennis elbow, but Elbow Ease turns this technique on its head. Slide your fingers into the silicon hoops and extend them away from your palm until they're spread apart from each other, then hold for a few seconds. By repeating this motion you will immediately feel it working. After back pain, elbow problems are the most common injury for golfers. Actually, golfers get tennis elbow far more than they get golfer’s elbow by a ratio of about 4 to 1. The lead elbow is more susceptible than the trailing elbow because it is kept straighter and absorbs more of the vibrations at impact. Elbow Ease’s value is in its versatility and it’s low price. It can be used on either hand and it not only helps you to get rid of your elbow pain, but it also helps you to strengthen your fingers and your grip. 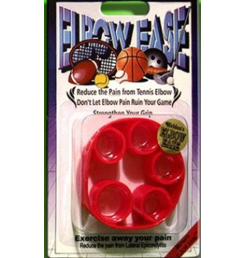 Whether you’re an athlete like a weight lifter, or in your home struggling to open a jar, Elbow Ease will help you. 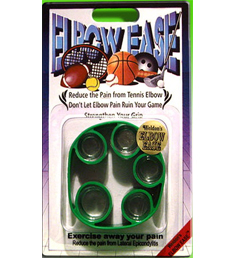 Whether you’ve injured your elbow or forearm from Bowling, fishing, and bike riding or suffer from Arthritis or carpel tunnel syndrome you can benefit by using Elbow Ease. Elbow Ease® can also help reduce recurring pain that might be caused by: Baseball - Sailing – Fishing - Football - Volleyball - Swimming. Also with work related strains from Plumbing - Carpentry - Computers and Gaming. “Thanks guys, my golf game has improved since I got rid of the pain in my arm. I thought it was golfers elbow, but the pain really was tennis elbow. Great product, my swing and game has never been better”. Please send any questions you have and we will respond immediatly.